A crystal is a solid formed by the solidification of chemicals, has a regularly repeating internal arrangement of atoms and molecules, and is bounded by external plane faces. Crystal particles form a variety of geometrical shapes due to their internal compressions. Crystals have aesthetic properties that have long made them attractive in jewelry. But they also have some properties that make them very important to the electronics and optical industries. Today, crystals are used in just about every type of modern technology. For centuries, crystals and other gems have been desired for their alleged magical healing and mystical paranormal powers. This belief continues today among occultists and New Age healers, even though it is based on nothing more than testimonials, the placebo effect, selective thinking, wishful thinking, subjective validation, sympathetic magic, and communal reinforcement. There is no scientific evidence that crystals are conduits of magical energies useful for healing and protection, or for telling the future. We can dismiss the pre-scientific belief in the magical powers of crystals and gemstones as due to the lack of scientific knowledge. Modern occultists, however, distort and falsify scientific knowledge in order to promote belief in their crystal products. According to the purveyors of this crystalline pseudoscience, crystals channel good "energy" and ward off bad "energy." They carry "vibrations" that resonate with healing "frequencies," work with the chakras and help balance yin and yang. Crystals allegedly affect the emotions and can be used not only for physical healing, but for emotional problems as well. Crystals can not only help with emotional healing, but with self-expression, creativity, meditation, and the immune system. None of these claims is backed by any scientific evidence. Today, crystal wands are used to heal auras in aura therapy. But one of the more egregious pseudoscientific claims regarding crystals is that, if arranged properly, they can provide protection against harmful electromagnetic forces such as those that are emitted from computer monitors, cellular phones, microwave ovens, hair dryers, power lines, and other people. The Bioelectric Shield was invented by a chiropractor from Montana, Charles Brown, who claims he heard voices in his head and had visions in his bed as to how to arrange crystals in the shape of a flying saucer in order to provide this protection. His bioelectric shields are sold for anywhere from $139 to over a thousand dollars. 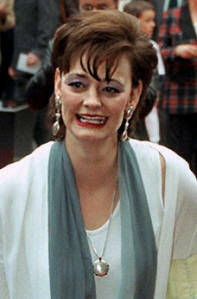 Cherie Blair, the wife of the former prime minister of the UK, wears one of these magical pendants. They are said to be "medically proven" and "based on Nobel Prize winning physics." Even if the claims about the protective power of these pendants were true, it would be necessary to envelop your entire body in one to achieve the desired result. By hanging a little piece of jewelry around the neck, you might be able to protect a small part of the throat, however. The New Age idea that crystals can harness and direct energy seems to be based upon a misunderstanding of one of the more curious characteristics of certain crystals, namely, that they produce an electrical charge when compressed. This is known as the piezoelectric effect and was discovered in 1880 by Pierre and Jacques Curie. Other technological developments had to occur before the piezoelectric effect could be put to use, however, and it was not until the 1950s that the piezoelectric effect could be put to general use in record player needles and a variety of measuring devices. Nowadays, these devices "are used in almost every conceivable application requiring accurate measurement and recording of dynamic changes in mechanical variables such as pressure, force and acceleration." The piezoelectric effect, however, does not give crystals healing or protective power, despite the claims of those who use and sell crystals in New Age and neo-pagan occultist shops. However, wearing crystals seems to give some people a feeling of protection. This, and their aesthetic qualities, seem to be the only virtues of crystal jewelry. Nor do crystals work any better than animal organs for divining the future, although grinding crystals for fortune telling is more humane and sanitary than disembowelment of poor creatures who don't know yesterday from tomorrow.